When Fiverr launched in 2010, it was largely viewed as a place to browse for quirky services. Its premise – a site that allowed users to buy and sell 'gigs' for $5, hence the name – attracted the silly, the bizarre and the borderline disturbing. "What do you get when you mix unemployment, frugal consumers and Internet boredom?" asked a Wall Street Journal article from 2010. "One possible answer – Fiverr.com." While its wacky collection of made-to-go-viral services helped get the word about Fiverr, "to be frank, it was never a big part of our business," says co-founder and CEO Micha Kaufman. While he readily admits that the stranger gigs on his site generate buzz, he also claims business services, such as graphic design, copywriting and translation, represented a large percentage of Fiverr's revenue from the beginning. Peruse the site, and you'll still find plenty of weird offerings. But Kaufman insists Fiverr has become a useful resource for businesses. Currently, the majority of buyers on the site are small and medium-sized businesses, ranging from a solo entrepreneur to a company of up to 100, and graphic design represents its largest service category Kaufman says. The number of services and categories on the site has continued to grow year over year, and Kaufman would like to see Fiverr become the go-to destination for marketplace services, just as Amazon is the go-to destination for online shopping. The $30 million the Fiverr just received in Series C Funding from investors – which raises the company's total outside financing to $50 million -- should help in this pursuit. In addition to the funding, the company has changed its pricing model to better emulate Amazon's one-click check-out. Now, a freelancer on the site can package his or her service and set the price (from which Fiverr takes a 20-percent cut), allowing buyers to purchase it as easily as they would a book on Amazon. "Our approach is like that of an ecommerce company," says Kaufman. "We take the negotiation out of it." To facilitate this, Fiverr has refined its search capabilities, allowing buyers to locate extremely specific services in over 100 distinct categories. Say you need a voiceover artist for a video. "We now allow sellers to productize their services," Kaufman says. "Do you want a male or female voice? An American or British accent? Studio quality, or will home quality do?" Like on Amazon or eBay, users can rate sellers based on the quality of their services. While services start at $5, Fiverr now makes the majority of its revenue from services that cost considerably more. While Kaufman declined to name the average price for a service on the site, the percentage that costs more than $5 has grown roughly in proportion with the percentage of business services available. 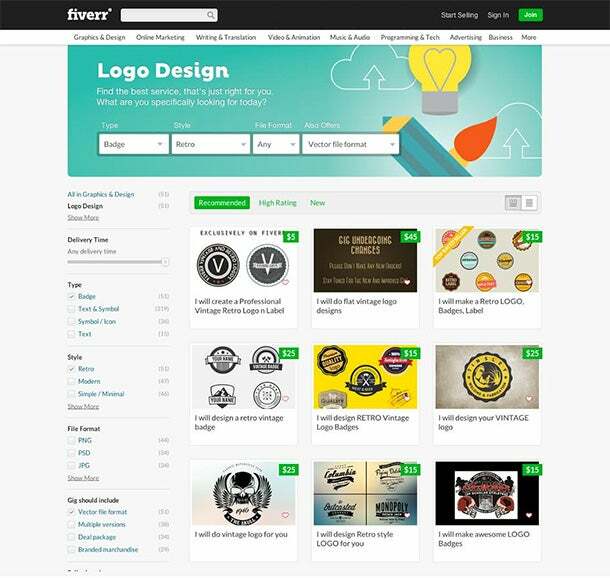 Currently, Fiverr counts multiple Fortune 500 companies as customers, which hire freelancers for large scale projects. While $500 used to be the maximum amount a seller could charge for a service, that number has jumped to $8,000, allowing freelancers to offer higher-quality, more labor-intensive work. "We are lifting the barrier on the pricing," Kaufman says.